For this test a single 8.5GB, high definition 1080p .MKV movie file is copied from a 120GB SSD system disk to the removable storage device (copy to), then from the removable storage device to the 120GB SSD system disk (copy from). While this test is influenced by the system disk SATA controller and by the number of files being transferred, it provides a simple real world indication of sustained transfer rates. Higher transfer speeds and lower transfer times are best. 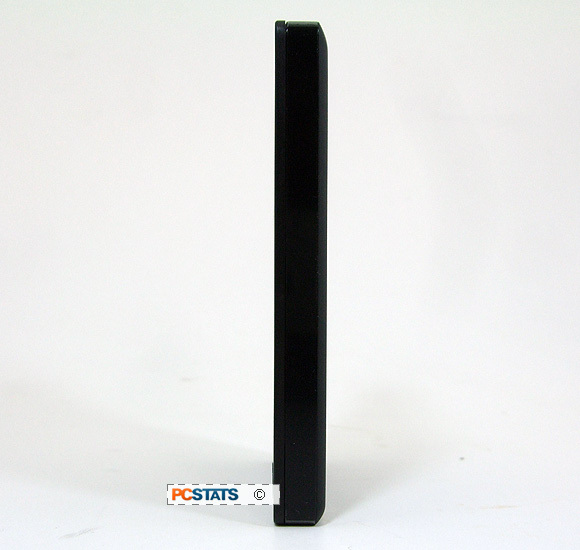 When connected via USB 3.0, the 2TB Seagate Backup Plus Slim external hard drive transfers a single 8.5GB test file to the PC at a rate of about 50MB/s. The same test repeated, from PC-to-external hard drive yields a quicker rate of about 53MB/s. There's not much to a portable external hard drive; plug it in, copy files and folders over and carry your data away - the quicker, the better. It's as simple as that... and if it isn't, don't buy the product. Seagate's 2TB Backup Plus Slim works well and offers the added capability of (limited) social media backups which we found (actually) pretty useful. The model PCSTATS tested was black in colour, but the same 2TB unit also comes in Red, Blue and Silver to suit your taste. All units work off a USB 3.0 interface. Seagate's Backup Plus Slim is also available in capacities of 500GB, and 1TB. Seagate's 2TB Backup Plus Slim retails for about $159CDN and is covered by a two year warranty. The top of the drive casing is anodized aluminum, the rest of the chassis is black plastic. It's hard to say how well this unit will hold up over time to scrapes and bangs... Seagate ought to include a simple sleeve case or something to give the drive a bit of shock protection and to keep the USB 3.0 cable from going missing. Build quality feels good, but I'm not confident in it's durability enough that I would chuck the Backup Plus Slim external drive into a bag without some kind of protective sleeve/cover. Worst of all is the USB 3.0 connector at the back of the drive... as near as I can tell this is just a surface mount connector soldered to PCB! The stiff USB 3.0 cable end connector puts a lot of flex on this surface mount device and it seems like a right-angle cable connector would have been the smarter choice to reduce strain here. With a demonstrated average read/write speed of about 90MB/s, the Backup Plus Slim external drive offers relatively good back up transfer times but won't come near to breaking speed records. The Seagate Dashboard software is dead simple to use and has features built into it which are handy. The software succeeds in positioning the Backup Plus Slim drive as a go-to device for offline storage. Recommended for desktop use, not at all recommended as a travel external storage device. Find out about this and many other reviews by clicking 'Like' to follow the PCSTATS Facebook page. Catch all of PCSTATS latest reviews right here.